So a few years ago when the Sharks were hosting a Stadium Series game against the Kings, I came up with a concept of what they might wear. Many people said it should be used as the full-time set. However, others said that the colors meshed too much and it bogged down the design. So, with Adidas set to unveil the uniforms tomorrow, I thought I'd throw my design in what I would hope the Sharks would do. Granted, I'm not expecting much. I'd be pleasantly surprised if there was something even close to this. Shoulder patches were left blank as I didn't know which one they were going to go with. I just saw that reveal in the teaser trailer this afternoon. So the orange could be removed, but I might actually be getting used to the orange...oh my, what is happening! He guys! 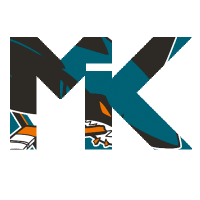 This is my San Jose Sharks concept using their new logos they unveiled last season. I tried to blend the old and the new to make a new, bold look for the Sharks. C&C is appreciated! Been a while and I had some free time so I did a quick cleanup of the Sharks jersey sets. Nothing major, mostly just what we've all been clamoring for since the last update for the primary and secondary sets, alternate has a few changes. Primary: Slightly thickened orange on sleeve stripe. Added yoke hem to match sleeve stripe. Replaced shoulder patches with SJ script and Fin alt logo. Removed unnecessary front number. Removed hockey stick from main logo. Secondary: Same adjustments as primary. Updated 'SJ' patch to teal from white for contrast. Alternate: Added gradient shading to sleeve stripes. Added yoke hem to match sleeve stripe with gradient from middle (now that I see it, it's a little off-center but pretend its centered). Added Northern California patch to replace one pair of SJ patch. Adapted 25th Anniversary patch for chest logo. Removed hockey stick and added gradient to teal. Removed outlines from number and name patch. Normally I'm not a huge fan of gradients but I was just playing around and the teal on black really makes it pop and gives the alternate a better vibe than just black version of home. Thoughts? To be honest, not much of a story behind the striping pattern I used here, it just seemed to fit the Sharks as I was working on it. I was actually thinking of giving this one a half orange/half black torso, and basing it on the pre-Edge jersey, but ultimately did this. Might do that anyway and post it here, who knows. A few weeks ago I did a time-lapse of a Whalers concept. I had a really fun time doing it so I made another. This time, I made an alternate jersey for San Jose. I personally love sublimated patterns on hockey jerseys, so this jersey is right up my alley. I also think the sublimated pattern looks like shark teeth. Which was totally not intended! Tell me whatcha' think.